At the end of October, Quiltworx will be announcing over a dozen patterns featuring these fabrics! Our official launch of the product line will be at Fall Quilt Market 2014 and patterns and fabrics will be in shops around the world immediately thereafter. Shops are allowed to start advance sales of the fabric on October 1st, although they will be in limited quantities. Wholesale customers can view and order the collection via their Sales Rep or contacting Timeless Treasures directly. Current Timeless Treasures customers can also use their wholesale login to preview and pre-order the collection on their website. Quiltworx.com will not be selling the Reclaimed West fabrics, but check the list below for shops that will be! To purchase all things Reclaimed West, enter HERE! Timeless Treasures hosted a Reclaimed West blog tour! Click the link for more information! Like Quiltworx and Timeless Treasures on Facebook for up to the minute updates preceding the launch of this fabric collection! You can also view our Reclaimed West Facebook gallery right here! We hope you enjoy! So...today's fabric is the FIRST I want to show off in the Reclaimed West Collection! This fabric is called ~ Meadow ~ JN-C2902. Watch this page tomorrow, for the photograph and story that inspired this fabric design and note the overlaid pattern, based on the Stepping Stones block! On Thursday, we'll show you a project that uses this fabric as a feature print! We can hardly wait to show you all!!! :-) #timelesstreasures, #reclaimedwest, #quiltworx, #judyniemeyer, #judelniemeyer, Timeless Treasures Fabrics, Inc.
Patti Finnegan It reminds me of the farm I grew up on and the farming equipment my Dad had. Sandra Pierson Can't wait to see it all! Jody L Siebel THIS IS FANTASTIC. I DO NOT KNOW WHERE I HAVE BEEN HIDDING BUT THIS SITE IS AWESOME!!!! Mary E. Jones Thank you Judel for both the great photograph and the narrative with it. So...it's now time for a quilt, made using the feature fabric, Meadow. This quilt is the Golden Harvest. There are other fabrics used here that we'll talk about more in the coming weeks! I think the picture demonstrates how wonderfully Timeless Treasures did in recreating our ideas in fabrics that are as true to the colors of fields and barns and wheat and fences as can possibly be. We're very honored to have worked with them! Timeless Treasures Fabrics, Inc.
Leonie de Haas I'm getting itchy fingers! Here's another shot of the Golden Harvest quilt. And, I'll post a third, with a closeup of the fabric! Rebecca Lydy Congratulations on the new release! Beautiful!! Here's a closeup of Meadow...used in a quilt! Barbara A. Hunter love the fabric! And, since that same print comes in two colors, I'm showing both of them to you, today! This is JN-C2906 Charcoal. Another dark fabric that we used throughout many of our designs that you will see this fall! We can't stop thinking of fun ways to use these two prints! Judy loves Black anyway...so this print has received a lot of her love and affection. We think this one would look amazing in a quilt with a fall harvest theme...Halloween...thanksgiving...it's a little mysterious! #timelesstreasures #quiltworx #judyniemeyer #judelniemeyer Timeless Treasures Fabrics, Inc.
Linda Jorgensen Jones This would be great in a Halloween quilt. Jill Traweek I love spooky stuff - this is awesome! 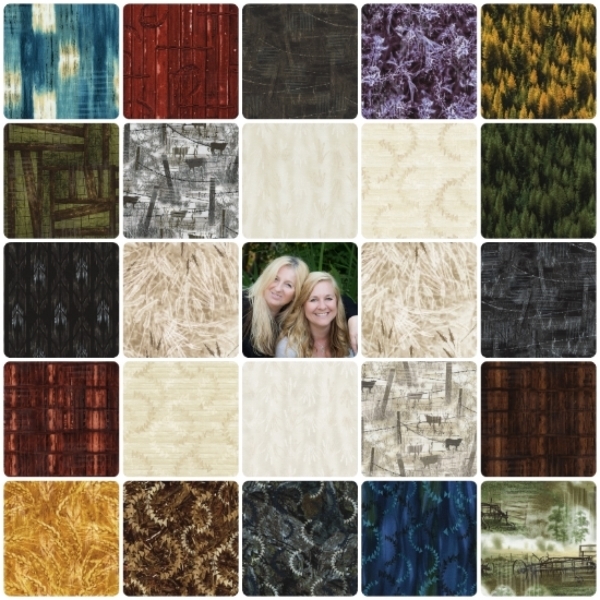 Our second piece of fabric we want to announce from the Reclaimed West Collection actually comes in TWO colors! A Sepia and Charcoal. Fabric number, JN-C2906 Sepia (below), is used in many of our quilt designs. Based on a series of pictures with Montana Fence Lines and standout features being leaning posts and barbed wire, it's real, and western, and fun. The Charcoal swatch is coming next! #timelesstreasures #quiltworx #judyniemeyer #judelniemeyer Timeless Treasures Fabrics, Inc.
Pamela Troughton This dark sky with the whisy white would make an amazing fabric! Cassie Marshall This is a truly fantastic photograph. Linda Erdmann Is there any Sprint Car material? Teresa Elam Ayars Awesome. Thanks for sharing.